LONDON (CelebrityAccess MediaWire) — The band Def Leppard has denied a report that they were preparing legal action against boy band One Direction over apparent similarities in the two band's music. UK newspaper The Mirror claimed that Def Leppard members were upset over the One Direction song 'Midnight Memories' which has a marked similarity to the classic Def Leppard hit 'Pour Some Sugar on Me.' However, in a recent interview with Billboard, the band has denied those the Mirror report, saying that while the songs are similar, they don't think it was intentional. 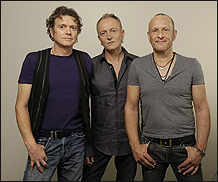 "The chords are one-four-five," Vivian Campbell told Billboard. "Those are the blues. You don't get more basic than that. I think what's more reminiscent of the Leppard thing is the production, the sound, the vocals, the reverb and the way it's assembled. "That is very flattering that all of a sudden these kids think it's a cool sound. I think a lot of people of their generation aren't going to connect their music to ours."